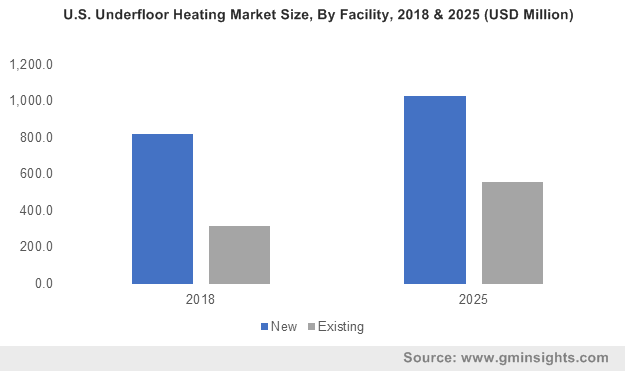 Underfloor Heating Market size was valued over USD 5.5 billion in 2018 and is anticipated to grow over 7% by 2025. Growing consumer awareness toward energy conservation coupled with ongoing promotion of clean energy technologies will fuel the global underfloor heating market growth. Escalating demand for space heating on account of extreme climatic conditions will positively impact the industry outlook. Furthermore, declining component and installation cost have stimulated the product deployment primarily across residential establishments. Introduction of several energy efficiency standards and codes toward the adoption of electrical appliances along with growing energy consumption primarily across offices and hotels will drive the market. Ongoing development of real estate sector along with expansion of service industry will complement the business landscape. Rapid development across emerging economies coupled with growing disposable income will stimulate the market growth. Replacement of existing heating systems on account of substantial energy and heat loss along with growing utility bills have inflicted significant industry growth. The systems have become more mainstream with increasing focus toward R&D and introduction of cost-effective solutions. Growing concerns toward energy savings along with increasing penetration of radiant heating technologies will foster the electric underfloor heating market. Growing demand for heating mats and cables owing to product suitability across range of application areas will encourage the product adoption. Regulatory mandates by respective state authorities toward the installation of energy efficient heating systems and carbon emissions will positively influence the industry landscape. Hydronic underfloor heating is projected to grow over 7.5% by 2025. Virtually invisible deployment, long term cost benefits along with development of low width pipes are the key factors leading to product adoption. However, high installation cost along with difficulty in deployment across existing buildings will limit the product demand. Paradigm shift toward the construction of green buildings coupled with the deployment of concrete flooring across new facilities will foster the underfloor heating market. Ongoing improvement in standard of living leading to adoption of advance home heating systems will propel the product demand. Expansion of existing public facilities including hospitals, hotels and offices will further enhance the product penetration. Existing facility is anticipated to surpass USD 2.5 billion by 2025. Increasing number of retrofitting projects across existing buildings in order to comply with energy efficiency standards have presented a favourable business scenario. The electric heating mats have offered the most suitable solutions owing to elimination of floor excavation and upliftment. Furthermore, quick incorporation with existing electrical circuit coupled with increasing number of DIY projects will positively enhance the business outlook. 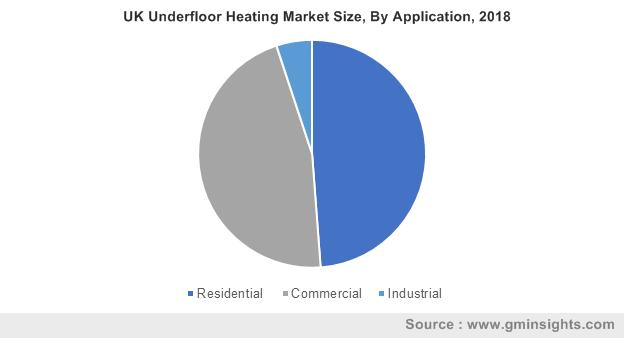 The residential underfloor heating segment was valued over USD 2.5 billion in 2018. Increasing adoption of central heating systems coupled with escalating demand for localized heating across bathrooms, kitchen and corridors will encourage the product deployment. Growing recognition across domestic consumer on account of development of low-priced electric variants will boost the product demand. Growing deployment of the product across offices and retail outlets on account various benefits including design & décor freedom, low power consumption and energy efficient operations will propel the commercial underfloor heating market. Growing demand for premium heating across public facilities including saunas, spa and others will facilitate the product deployment. The U.S. underfloor heating market is anticipated to exceed USD 1.5 billion by 2025. Extensive construction of high-rise building infrastructure along with rapid expansion of service sector have incurred significant business growth. Growing investment toward construction of multifamily apartments along with rapid surge in the refurbishment activities will enhance the business outlook. Stringent energy efficiency standards along with development of digital home heating technologies will stimulate the Europe underfloor heating industry. Severe cold during winters have instigated demand for heating systems. The regulatory authorities have published the EU Energy Efficiency Directive in order to promote the adoption of energy efficient heating appliances across commercial and residential apartments. 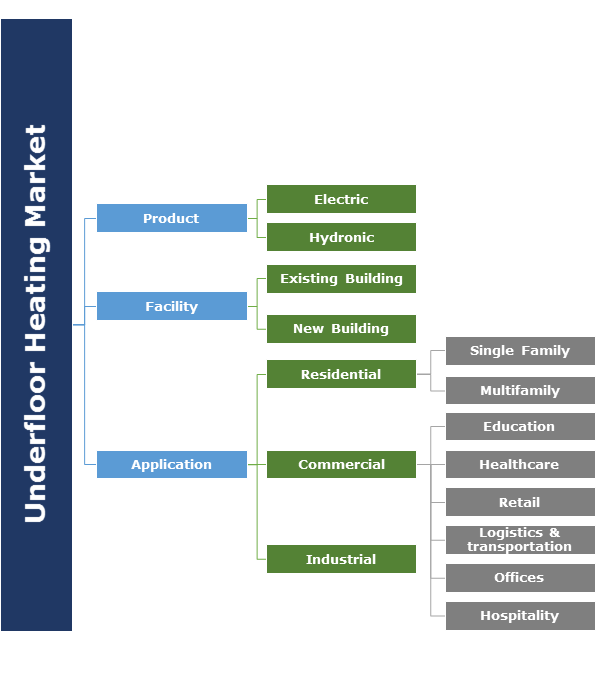 Eminent players operating across the underfloor heating market include, Siemens, Schneider, Danfoss, Emerson Electric, Uponor, Pentair, Schneider Electric, Honeywell, Warmup, Robert Bosch, Sensata Technologies, Nexans, REHAU, Mitsubishi, Hunt Heating, H2O Heating and Amuheat. The leading players across the industry are directing toward managing cost and provide competitive pricing to the consumers. The companies are making strategic alliances to enhance their technological capabilities and gain edge over its competitors. For instance, in March 2017, Honeywell and Huawei announced their collaboration for the development of smart building solutions with the use of Internet of Things (IoT). The underfloor heating systems provides efficient heating with a network of underground cables or pipes connected to the thermostats and the main electric circuit. The cables are laid beneath the floor surface with a layer of insulation to avoid heat loss. While the hydronic system uses heated water from boilers mixed with anti-freezing material as a heat transfer fluid that is circulated between boiler and floor. It provides constant heat to homes for a long duration of time and helps in saving energy.